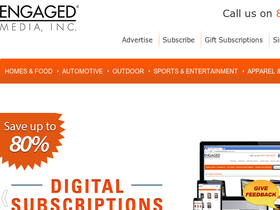 Engaged Media, online at engagedmediamags.com, is the go to shop for online magazine subscriptions. Engaged Media offers subscriptions for online magazines in categories such as home, food, automotive, outdoor, sports, entertainment, apparel, and more. Before shopping at Engaged Media, be sure to stop by RetailSteal.com for the latest Engaged Media coupon codes and discount codes. Use code at Engaged Media and save 10% on any order. Use code at Engaged Media and save 10% on last minute gifts. Enjoy exclusive promos with email sign up at Engaged Media.